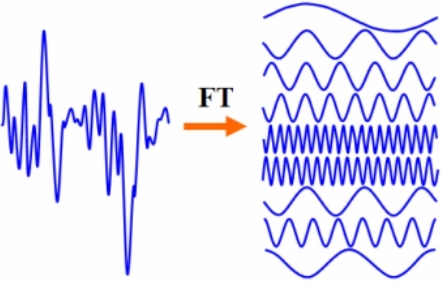 The Fourier Transform deals with time based waves – and these are one of the fundamental building blocks of the natural world. Sound, light, gravity, radio signals, Earthquakes and digital compression are just some of the phenomena that can be understood through waves. It’s not an exaggeration therefore to see the study of waves as one of the most important applications of mathematics in our modern life. JPEG picture and MP3 sound compression – to allow data to reduced in size. Building’s natural frequencies – architects can design buildings to better withstand earthquakes. There are many more applications – this Guardian article is a good introduction to some others. From the above cosine graph we can see that it is periodic time based function. Time is plotted on the x axis, and this graph will tell us the value of f(t) at any given time. The graph below with 2 spikes represents this same information in a different way. It shows the frequency (plotted on the x axis) of the cosine graph. Now the frequency of a function measures how many times it repeats per second. So for a graph f(t) = cos(at) it can be calculated as the inverse of the period. The period of cos(at) is 2pi/a so it has a frequency of a/2pi. Therefore the frequency graph for cos(ax) will have spikes at a/2pi and -a/2pi. But the remarkable thing is that every continuous wave can be modelled as the sum of sine and cosine waves. So we can break-down the very complicated wave above into (say) cos(x) + sin(2x) + 2cos(4x) . This new representation would be much easier to work with mathematically. The way to find out what these constituent sine and cosine waves are that make up a complicated wave is to use the Fourier Transform. By transforming a function into one which shows the frequency peaks we can work out what the sine and cosine parts are for that function. For example, this transformed graph above would show which frequency sine and cosine functions to use to model our original function. Each peak represents a sine or cosine function of a specific frequency. Add them all together and we have our function. The maths behind this does get a little complicated. I’ll try and talk through the method using the function f(t) = cos(at). So, the function we want to break down into its constituent cosine and sine waves is cos(at). Now, obviously this function can be represented just with cos(at) – but this is a good demonstration of how to use the maths for the Fourier Transform. We already know that this function has a frequency of a/2pi – so let’s see if we can find this frequency using the Transform. This is the formula for the Fourier Transform. We “simply” replace the f(t) with the function we want to transform – then integrate. To make this easier we use the exponential formula for cosine. When we have f(t) = cos(at) we can rewrite this as the function above in terms of exponential terms. We substitute this version of f(t) into the formula. Next we multiply out the exponential terms in the bracket (remember the laws of indices), and then split the integral into 2 parts. The reason we have grouped the powers in this way is because of the following step. This is the delta function – which as you can see is very closely related to the integrals we have. Multiplying both sides by pi will get the integral in the correct form. The delta function is a function which is zero for all values apart from when the domain is zero. So, the integral can be simplified as this above. So, our function F will be zero for all values except when the delta function is zero. This gives use the above equations. Therefore solving these equations we get an answer for the frequency of the graph. This frequency agrees with the frequency we already expected to find for cos(at). This therefore is zero for all values except for when we have frequencies of a/2pi and b/2pi. 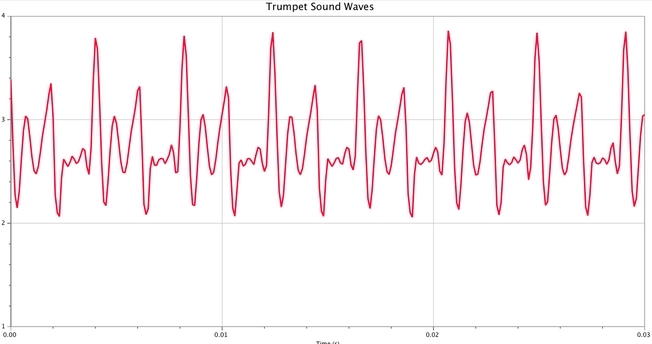 So the Fourier Transform has correctly identified the constituent parts of our function. If you want to read more about Fourier Transforms, then the Better Explained article is an excellent start.